As a teenager, I always wanted the cool stuff, always wanted the best gadget because I loved them plus they made me the coolest kid in those days. Today, with the vast improvement in technology, the history of watches has taken a huge turn around as these various upgrades are being used to design watches today. 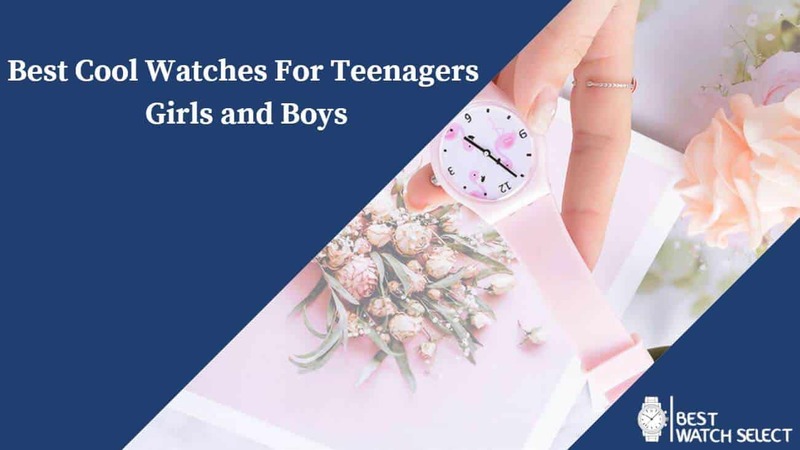 The taste of teenage boys differs from teenage girls, and when it comes to watches, these differences are still there. A lot of watches are being designed every day with different designs and functionality. Some are preferred by boys than girls, while others are unisex, can be worn by both girls and boys and still look really cool. To know the best of the best in terms of watches, we have to focus on precision, design, features of the watch and to top it all off to make the colleague and friends of a wearer of the watch a green-eyed monster. 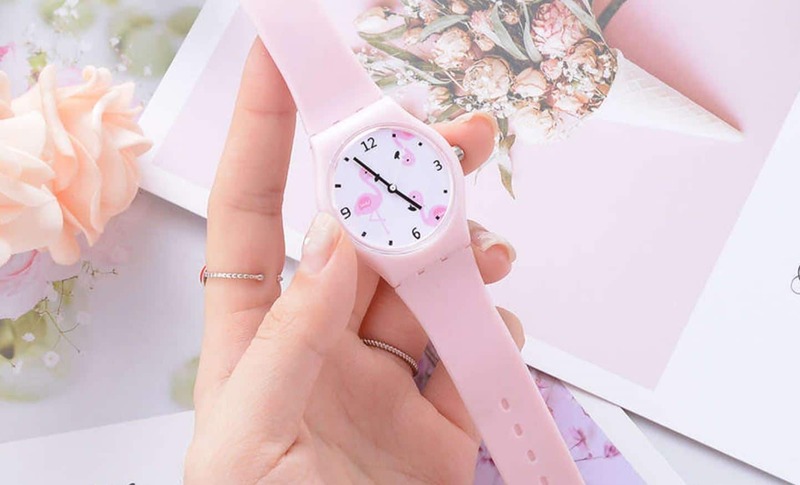 So, having done some research I found some really cool watches that are really loved by teenage boys, likewise did I find some really cool ones loved by teenage girls also. And the best part is that most of these watches do not go over a $500. I have decided to compile a list of some of the coolest watches for teenage boys and girls, so jump right into the list and choose a really cool watch for the price you want. The universally agreed upon loved above all sports watches is the ironman classic wristwatch. With a lightweight design in such a way that it is sealed for water resistant, while it also allowed you direct access to the entire timer, alarms, and back-light. It’s water resistant feature, can offer water resistant of up to 100m in water, making this watch a perfect watch that can be worn during swimming, snorkelling, but not for diving, because in diving you may go below 100m underwater. The ironman classic wristwatches come in three (3) major varieties, which are the ironman classic 100, the ironman classic 50, and the ironman classic 30. These three (3) different varieties of the ironman classic wristwatch have their similarities just as they have their differences which make them unique in their own way. All the ironman classic wristwatches feature two (2) time zones, customizable alarm, countdown timer, stopwatch lap memory, and an indigo back-light. They can be used while swimming because they are water resistant. It has Indiglo backlight technology that enable you to get the best out of the watch as you can check the time during the day and at night. They are a bit selective in terms of your dress code and are mostly cool on only teenage boys. It also makes use of a non-rechargeable battery they have to be replaced each time the battery gets low. 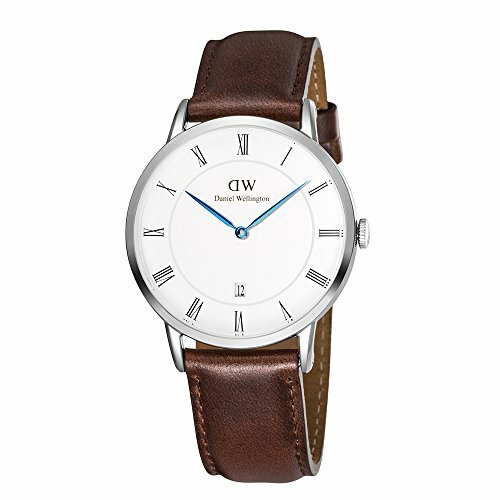 The Dapper St Mawes from the manufacturer Daniel Wellington is a highly rated and well-priced wristwatch for males that is worth buying. With a unique combination of Stainless Steel case and leather strap, with a fixed Stainless Steel bezel. The dapper St Mawes is made with a white dial, a blue handle and the hour markers are in Roman numerals. This classic analogue wristwatch also features a date display just above the 6 o’clock marker and a quartz movement. To adjust the time, there is a push/pull knob just as the right-hand side of the wrist west when you are wearing it. The Dapper St Mawes is made with a scratch resistant crystal mineral, and a solid case back. This sleek wristwatch is water resistant and resists water of up to 100m in depth. The elegant case merges perfectly with Italian leather to give the watch that extra look to make you marvel. The Dapper St Mawes still remains one of the most excellent wristwatches for a male. They add a bit of a matured looks to the wearer. You can easily tell the day of the month as you check the time. It has to be replaced such time it gets low, as they are also quite expensive. It can only be used in places with a bit of light as it has no back light. The apple watch series 3 is a high-tech watch that can offer a lot of advanced features not many wristwatches can. 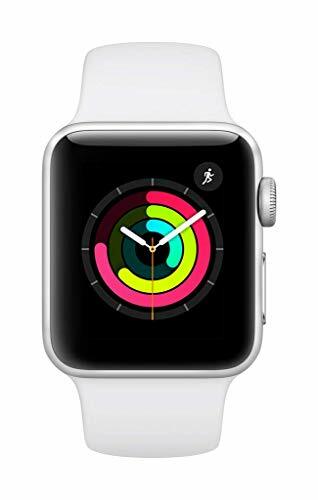 It features GPS, Optical heart sensor, Digital coloured screen, S3 with a dual-core processor, Accelerometer and gyroscope, Swim proof, and the awesome watchOS 5, and with makes it an excellent choice. Have you ever wonder if a watch can make a call, well this unique apple watch series 3 supports an emergency SOS, walkie talkie, and send messages, pretty cool right! The apple watch series 3 can be your companion because it can detect low and high heart rate and notify you, while it can also automatically detect when you are working out. It also supports some high features for runners like cadence and pace alert. This wristwatch can also allow you to listen to apple podcast and apple music, as it supports Wi-Fi and Bluetooth. And the best part is that you can enjoy all this from the comfort of a just wristwatch. The apple watch series 3 is actually unisex, but it has a more appealing look on guys. Used as a hands-free device. The band size is not adjustable, it only shows in small, medium and large sizes. 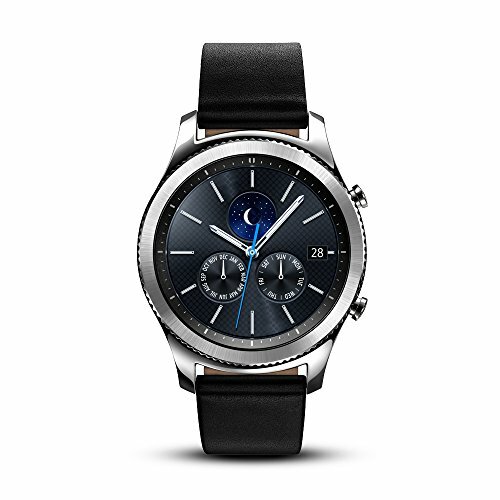 The Samsung gear S3 classic smartwatch is an advanced watch that combines style with the latest innovation of technology which allows you to connect to your Android and iOS smartphones. With its Bluetooth compatibility you can never miss a moment, moments like text, call, emails, and alert, all from the comfort of your smartwatch without reaching for the phone. It also features a built-in mic and speaker meaning you can also make and receive calls from the Samsung gear S3. The Samsung gear S3 smartwatch is designed to allow you recharge the battery rather than replace them, while the battery can last for days without recharging and when the battery is low it can be recharged with a wireless charger. You can also use the Stainless Steel bezel to easily access applications and notifications. One of the main reasons why the Samsung gear S3 stands out is because of its military-grade performance like water resistant, dust resistant, remaining functioning at extreme temperatures, and keeps working after occasion drops. It also features a GPS tracker, making it easy to share your location. This smartwatch is an excellent choice for tech geeks. This smartwatch can be connected with your smartphone either an Android or an iOS. Can be used as a hands-free device. With an upgraded rechargeable battery. It can stay up to 3 days without recharging it. It supports iOS smartphones but something apps are unavailable. 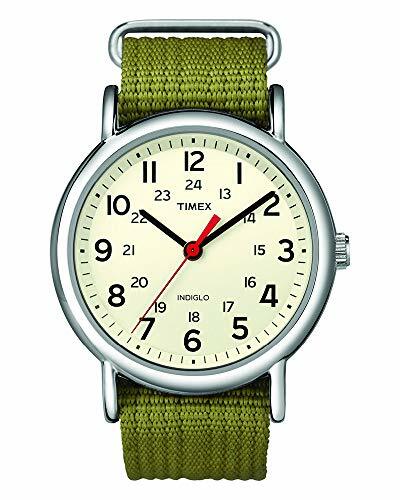 The Timex weekender wristwatch is designed for comfort and ease of wearing, with its interchangeable slip thru and quick-release strap, you can never go wrong when you are wearing the Timex Weekender. The Timex Weekender is made to late for a long time, with quality materials like woven fabric, real leather, a scratch-resistant glass, and the casing is made of metal. This unique wristwatch features a revolutionary Indiglo backlight technology that allows you to check the time clearly at any time. The Chronograph is awesome, and the Timex weekender chronograph has a stopwatch function that can measure up to 1/20 of a second. It has an extra pusher that can be used to start and stop the chronograph function. The Timex Weekender is a type of wristwatch you wear when you want to be yourself, with its classic design that can be used to customize your outfit or your mood. 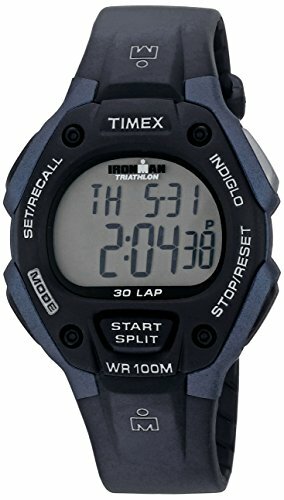 This Timex wristwatch is water resistant and can resist water of up to 100m beneath the water, but it is not suitable for swimming and bathing. If you are in search of a perfect wristwatch for guys, then this is an excellent choice for you. It features a chronograph that can measure up to 1/20 of a second. It also uses a non-rechargeable battery that needs to be replaced when low. 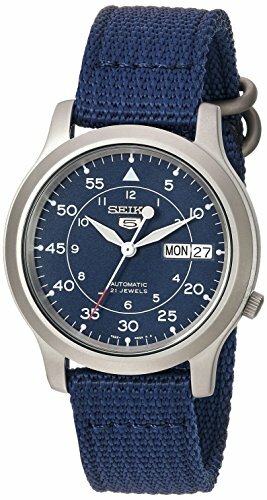 The Seiko 5 automatic blue canvas has a fixed Stainless Steel bezel, with an Arabic numerals marker at five minutes interval, this minute marker is around the outer rim of the watch, with a blue dial and a luminous hand, the watch can be used at all times. The Seiko 5 automatic blue canvas with its analogue luminous hand also features a date display at the 3 o’clock position, where it displays the days of the week. This classic analogue Seiko 5 automatic blue canvas can resist water up to 30m meaning that it is unaffected by splashes of water or a quick immersion in water. With its 37mm Stainless Steel case made with hardlex dial window, just gives it that extra touch it needs. The best part of this watch is that they are not operated with battery but they are powered automatically by movements of the wearer’s hand, and they can have for up to 40 hours power reserve. In the world of classic watches, time is measured with a Seiko watch due to their heritage of dedication of the art and science of time. It is not operated on batteries, but as the wearer’s hand is moving, it is automatically powdered. It also has luminescent hands meaning this watch can be used at all times, even at night. You have to wear the watch for up to 8 hours a day in other to maintain an accuracy of time, or manually wind the crown. 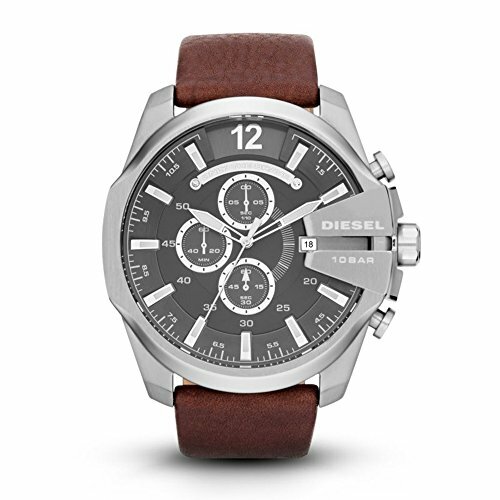 The diesel analogue dial watch has been one of the leading wristwatches in the realm of casual fashion, and they are known for moving through trends in industries, as the diesel analogue dial watch does not follow trends but make trends. With its same unique features, the diesel analogue dial watch has evolved in recent years to become a true alternative to luxurious watches. Having one of this bad boy’s wristwatches, it gives to your looks, a bold, rebellious and never shy style. The diesel analogue dial watch features a three-hand analogue display, and three chronograph subdial, and a mineral crystal face that makes it hard to stretch. They are also water resistant of up to 100m beneath water which makes them excellent for swimming, but not diving. This authentic product is also made with genuine leather hands with buckle closure. The case of this sleek watch is made with Stainless Steel with some detail cut out which give it that extra detail that makes it a great choice for men. It has a mineral crystal face, meaning that the watch wouldn’t scratch easily. It also has a leather calfskin band that is adjustable to size. It uses a non-rechargeable battery that has to be replaced when low. This Casio watch has a detailed design that is easy to operate and is suitable for athletes. The Casio quartz resin sports watch is made with resin materials, such as the durable resin case, a fixed black resin bezel, and a black resin band with an adjustable buckle. 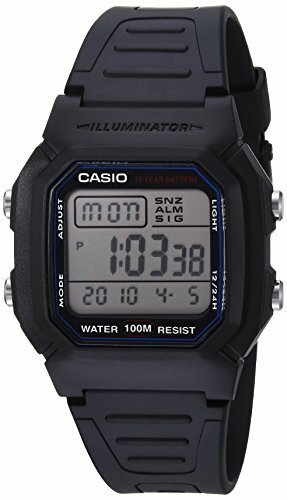 This Casio watch features digital time and a date display of day and month. It unique and perfectly planned out design has four buttons two at each side, where the two on your left-hand side while wearing the watch, one is for the light and the other mode. The other two and your right-hand side while wearing it is for adjustments. The Casio quartz resin sports watch is also made with a powerful battery that can last approximately up to 10 years, and it also features an LED backlight. It is also water resistant, as it can resist water up to a 100m beneath the surface of the water. It’s a digital watch that allows you to easily check the time and date. With a back resin buckle band, you can wear this watch to your comfort. It is quite selective on your outfit. Best worn on a sports outfit. 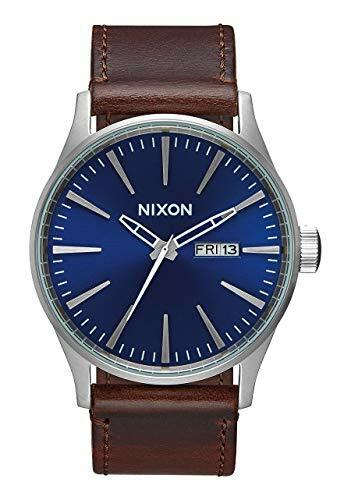 The sentry leather watch from the manufacturer Nixon is a watch that brings out the inside you, as they are made with Stainless Steel case, and a hardened mineral crystal to protect the face of the watch from cracks and scratches. The back of the case is made with Stainless Steel and they are screwed down, and the hands are made of leather with Stainless Steel buckle. The sentry Stainless Steel leader watch is a three hand analogue watch, with date display of day and the weekday, which is displayed at the right-hand side if the watch while wearing it. This sentry leather watch is water resistant of up to 100m beneath the water. 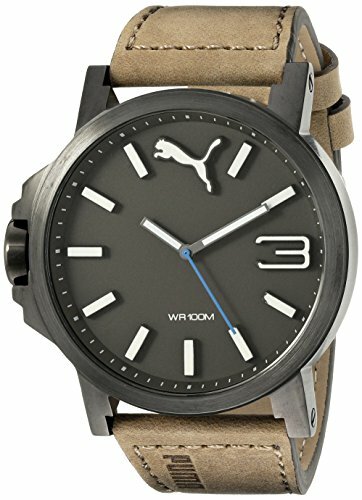 They may be understated but it is quite noticeable that the design has a modern twist of the blue watch face and a classic brown leather band, which is now combined with Miyota Japanese quartz to give it that top-notch quality. This unique wristwatch is a standard watch for men. The hardened mineral crystal used at the face of the watch protects the watch from scratches. It also has a Japanese quartz movement which keeps precise time. The Skagen men’s Jorn is designed with the perfect size that brings the sharp classic looks. With its Stainless Steel casing, the Skagen men’s Jorn can support up to 50m water resistance, making them a great choice for short periods of recreational swimming and showering, and not for diving. 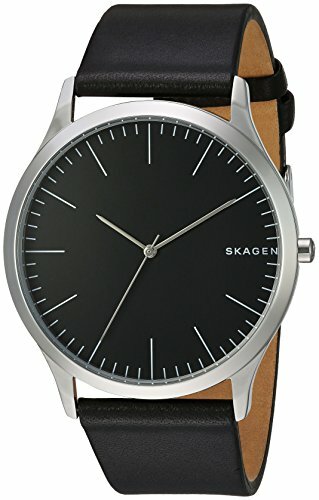 The Skagen men’s Jorn is an analogue wristwatch with three hands, the house hand, minute hand, and the second hand. They are also made with a mineral crystal face to shield the watch from cracks and scratches to the surface. The Skagen men’s Jorn wristwatch is also designed with a genuine leather band with buckles. The leather band is also interchangeable between all other Skagen products with 22mm in size. The hour and minutes are marked with a black silver tone hand. This watch is an undisputed choice for men. It has a leather band with buckle closure allowing you to be able to wear this watch with ease. It has unique mineral crystal face that makes it hard to scratch. Does not have s backlight. The ultra size analogue puma wristwatch employs the ethnic design of functionality and simplicity, basically, the ultra size analogue puma wristwatch is all about paying attention to little details. The oversized matte casing gives this watch a sleek design. It has a nicely integrated crown on the left-hand side of the watch, and the hour markers are elevated. This wristwatch is a very stylish profile and its 3D logo sparked dial. The 3D logo is engraved on the oversized stainless steel casing which is about 50mm in size. It also features an analogue display with three hands, the hours, the minutes, and the second’s hand. The hour marker around the watch is made with indices stick and at the 12 o’ clock position, there’s a puma logo and an Arabic numerals marker at the 3 o’clock position. It also features a comfortable leather strap with a Stainless Steel Buckle. The ultra size analogue puma wristwatch is water resistant and can resist water of up to 100m in depth, in general, suitable for swimming but not suitable for diving. The metal casing of this watch makes the watch look new at all times because the metal does not fade. 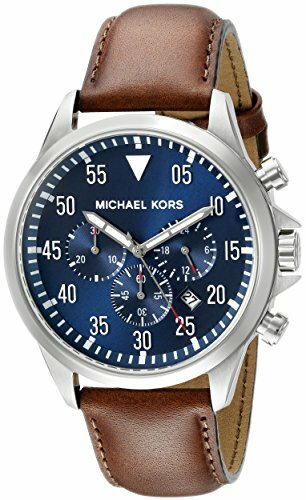 This wristwatch from Michael Kors captures the essence of a jet lifestyle; the Michael Kors gage watch features a leather strap and a round Stainless Steel case of about 45mm in size, with a fixed Stainless Steel bezel. 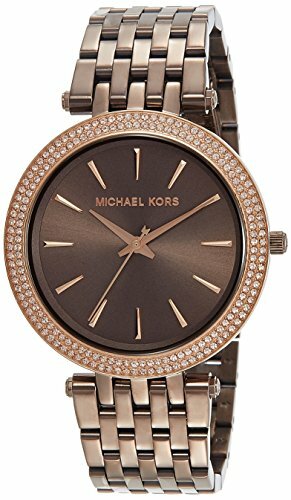 The Michael Kors gage wristwatch is an analogue wristwatch, with silver-tone indices, with the logo Michael Kors engraved just beneath the 12 o’ clock marker. This silver-tone wristwatch, the Michael Kors gage, features a blue sunray dial, date windows, a white filled hand, and three sundials at the bottom just above the 6 o’clock marker. The calendar feature of this wristwatch is located between 4 o’clock and 5 o’clock positions on the clock. This wristwatch is water resistant as it is also designed to stay up to 100m beneath the water, generally, they can be used for swimming, but not scuba diving. With all the awesome features of the Michael Kors gage watch, they are perfectly worn by males. The leather calfskin band with buckle allows you to adjust this watch to your comfortable size. 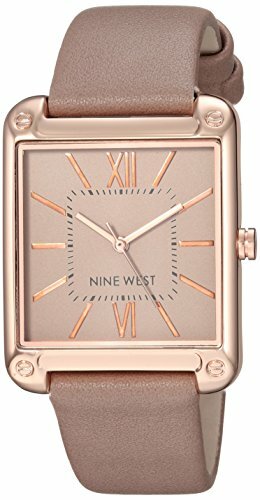 The rubber strap watch from nine west is a durable fashion accessory, with a mix of rubber-metal case and a faux suede strap, this timepiece can be used every day as it suits your dress and looks great on the wrist. It features a Japanese quartz movement although they are not water resistant. It features a plain dial with just the brand name Nine West written just above the 6 o’clock marker, as it also features a stick marker around the dial. Their buckle closure allows you to adjust the watch to a comfortable size. The Casio LRW200H-7BVCF Dive Series Sports Watch is a perfect choice of watch for females because of its compact and simple nature. This watch is an analogue timepiece which has its time marker on an hourly base, with three hands, the hour hand, the minute hand and the second hand. The watch also features up to 100m water resistance meaning it alright to swim with it, but not suitable for scuba diving. It has a bi-directional rotating bezel and it also has a date display. 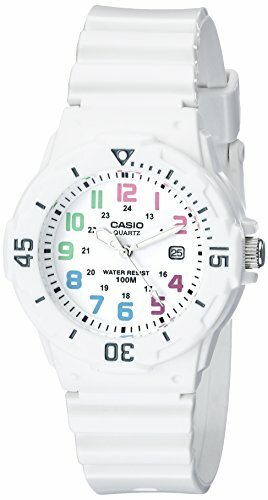 The Arabic numerals marker of this Casio watch is multi-coloured, and it has a gloss white resin band. The date display window is at the 3 o’clock marker, which has on its round dial a 12 hour Arabic marker, and a smaller 24 hour Arabic numerals marker which is just below the 12 hours Arabic numerals marker, with also a 60 minutes marker with a combination of both stick and Arabic numerals markers, which is just above the 12 hours marker on the casing of the watch, to add a pop of colour to your outfit. This watch also features a moulded resin band with buckle closure. This watch is an excellent choice for females. Non-rechargeable battery that has to be replaced when low. 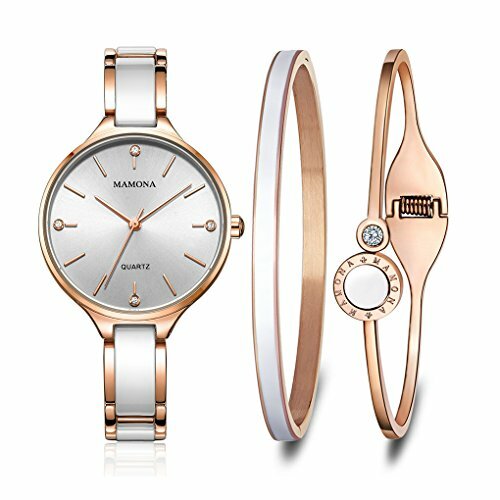 This mamona watch set is a watch any lady would love to have, with its feminine looks, this watch is much more attractive than its description. It comes with two sets of bangles a and wristwatch. This watch is strong and durable as it is also lightweight. This watch looks great while wearing casual attire or dress. This mamona watch features an original Japanese quartz movement which keeps precise and accurate time. The dial of this mamona watch is made of crystals. It also features a Stainless Steel and ceramic material finishing with pearl, which is extremely durable with a lustrous finishing that would not tarnish or scratch. The ceramic material gives this mamona watch a sleek and lustrous feel, making it a classy and feminine watch. You also do not need to worry about the band length, as it fits wrists up to 7.5 inches. It comes with two bracelets and a watch. It is made with sapphire crystals which is scratch resistant. They are powered with a non-rechargeable battery which means they have to be replaced when the battery gets low. This eco-drive stainless steel silhouette bangle watch is a sophisticated wrist watch from the producer, the citizen. This wrist watch features a classic design in Stainless Steel and a clean silver dial with stick markers that are sleek, simple and timeless. This high-tech wristwatch does not require a battery to work, because they are powered by light. They are also built with mineral crystals which shields the screen of the wristwatch from scratches and cracks. Although they are powered by light, the also feature a 1 lithium-ion battery as an alternative source of power supply for the wristwatch. They are also made with a Japan’s quartz for precise and accurate time. This Stainless Steel watch also supports water resistance of about 30m, with Stainless Steel material for the bezel buildup. Meanwhile, it is not too conservative or wild, this eco-drive watch strikes the perfect balance and its an excellent choice for women. It’s a unique mineral crystal to ensure that the screen does not scratch easily. They are powered by light but has a battery as an alternative source of power. This watch is made so unique with all the features that give you that feel of stainless steel bracelet with a push clasp closure. They are also made in a round shape. The Darci stable watch is an analogue watch, with a three hand display, and a stick marker which is hourly. It is also a water-resistant wristwatch of up to 50m beneath the water. The awesome part about the Darci stable watch from Michael Kors is that it has up to 2 years warranty. It’s water resistant feature enable that this watch stays perfectly fine when water is splashed on it, or it drops in water. The Swarovski crystals stainless steel watch is an American brand from the producer Bulova. The mother of pearls, with an hourly marker of crystal pearl at 3 o’clock and 9 o’clock, and Arabic numerals marker at 12 o’clock and 6 o’clock. It also features silver-tone stainless steel, with a Swarovski crystal studded bezel. This classic watch from Bulova features 70 Swarovski crystals that are individually handset on the case and bracelets. It also features a mineral curved metalized crystal. While it has a white pearl dial. This watch is water resistant to 30m, meaning it can withstand rain or splashes, but not submersion or showering. This is also a perfect wristwatch for females. It is water resistant, which ensures that it stays perfectly working if it accidentally drops in water for a few seconds. They do not feature a backlight. The nine west 2116 strap watch is a unique wristwatch that reflects on your style. Also, the nine west 2116 strap watch features a mineral crystal lens, which gives the watch that classic look. 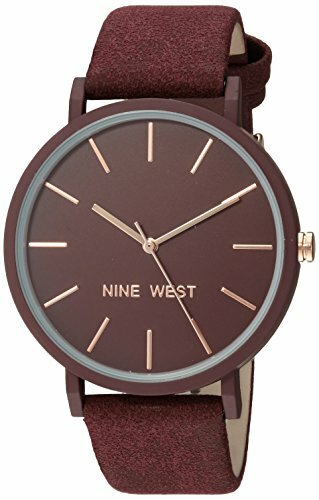 It is an analogue wristwatch and it has its brand name Nine West written just above the 6 o’clock marker and the 12 o’clock and 6 o’clock markers are written in Roman numerals while the rest are stick markers. The Japanese quartz movement of this watch helps keep precise and accurate time. Although this watch is not water resistant. It uses a piece of a battery also like most watches, and are perfect for females. Its mineral crystal lens ensures the screen of the watch does not scratch easily. 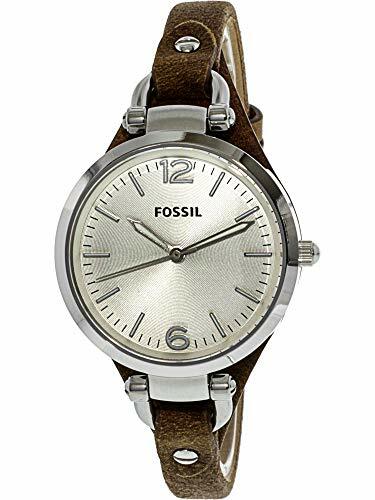 The fossil George ES3060 is an attractive ladies fossil analogue watch with a white textured dial, that has numerals 12 and 6 written at the 12 o’clock marker and the 6 o’clock marker. It also features a quartz movement with 3 hands analogue display. The case is made with Stainless Steel making this attractive watch look sleek. The fossil ladies watch is stylish water resistant watch of up to 50m, meaning it can be used while showering or short period of swimming, but not suitable for diving. The fossil gorge ES3060 is made with genuine leather strap band with buckle closure. The brand name fossil is written on the dial just below the 12 o’clock marker. The mineral crystal doesn’t allow the face of the watch to scratch easily. They are powered by a non-rechargeable battery that has to be replaced when low. 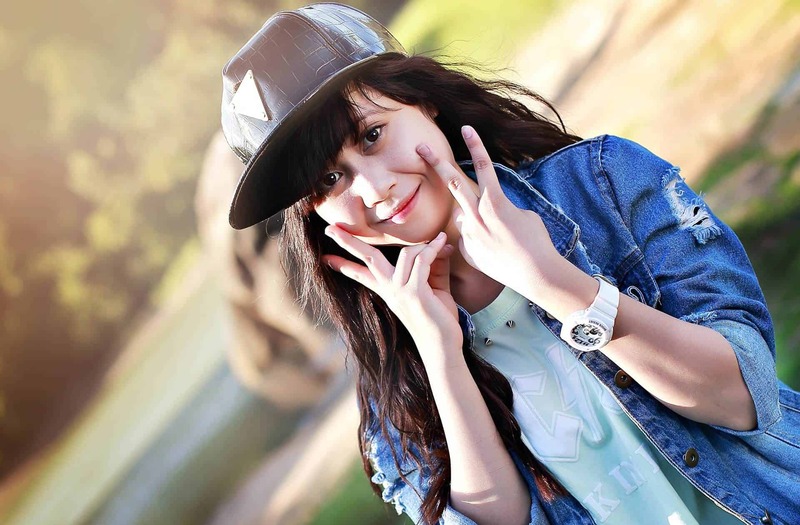 In this article, the best cool watches for teenagers girls and boys given above differ in their manufacturer, features, and functions, however they all have one thing in common; they are all top quality watch. Say goodbye to the old wristwatch; and embrace the new watch you see above. You will not be disappointed the next time.